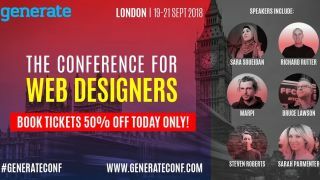 Flash sale: Save on Generate London tickets for 24 hours only. Big fan of a bargain and keen to learn direct from cutting-edge web designers and developers? Well today is your lucky day: the Generate London 2018 flash sale has launched, meaning that you can grab two or three day conference tickets for a massive 50 per cent off – for 24 hours only. Returning to the UK capital for its sixth year, Generate London is packed full of inspiration and insight covering the latest in web design and frontend development. Bringing you 16 engaging and informative talks – see the full schedule here – from the industry’s best and brightest minds, Generate London will help you up your game in areas like CSS animation, JS frameworks, UX and AR and include speakers such as Clearleft co-founder Richard Rutter, designer and entrepreneur Sarah Parmenter and three.js creator Ricardo Cabello. If you can't make these workshops, a two-day ticket is also a cut-price bargain, at just £197.50. There’s so much first-class conference content on offer and yet only a short amount of time to grab your cut-price ticket: our flash sale expires tonight at 23:59 BST. So if you want to save yourself some dough on your Generate London ticket, you'd better buy one now.